Every so often, I survey my customers to find out their biggest concerns related to trading and trading computers. Every time, they say one of their top concerns is staying safe and secure on the internet. So in this post, I want to share some ways Google helps you to stay safe. 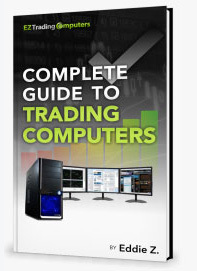 I find that most traders use at least several of Google’s services. You probably don’t think of it this way, but if you use Google Search, Google Calendar, Gmail, or Google Docs, you are using Google services. Google updates the policy regularly. It recently completed a significant revision to reflect the General Data Protection Regulation (GDPR). GDPR is the European Union’s new data protection and privacy rulebook. It went into effect in May 2018. Google explains their approach to keeping you safe on safety.google. To look at your specific security dashboard, from safety.google click on ‘Google Account’. Or, go straight to myaccount.google.com. Let’s dive into the various aspects of these tasks. Within the Sign-in & security group, you’ll want to run the security checkup and consider setting up 2-step verification. The Security Checkup runs checks on all your devices and apps. The information is gathered and summarized into 4 categories. Check each one and take appropriate action. Third-party access: See which apps can access information in your Google accounts. Remove access for apps you no longer use or need. Your devices: Check for suspicious logins or unverified access. If you don’t recognize a device, best practice is to change your Google password. Recent security events: Check security-related activity from the last four weeks (e.g., password changes). Sign-in & recovery: Set or confirm alternative ways Google can reach you or verify it’s really you signing in. These will help you get access to your account in case you forget your password. In addition, you may want to turn on 2-step verification, especially if you are super worried about hackers discovering your password. Once this is on, hackers will not be able to gain access just by guessing your password. They will also need physical access to your devices. From the Sign-in & security box, click on Signing in to Google to turn 2-step verification on or off. 2-Step verification is a great security precaution against possible attacks. However, just be aware that it will cause launching of Google services to be more time-consuming. Privacy Checkup shows information about your custom setups. Within the privacy checkup window, you can use the privacy settings to control access and sharing. For example, you can tell Google to share on Twitter when you upload or like a video. And, you can optimize ad settings to make Google only show ads that are relevant to you. Also within the Personal Info & Privacy group, use My Activity to check how much time you are spending on various activities, such as researching stocks. It’s a much more in-depth look at your online behavior than you get from just looking at your search history in your browser. Download activity information from individual apps. You can specify fairly granular data, such as your Reading List or list of Contacts. This more-powerful historical search functionality could be very helpful to you as a trader when looking for something you saw in the past but didn’t bookmark. It could also be handy if you’re working on a shared computer and don’t want others to see what you’ve been researching. If you’re concerned about your online safety and the security of your trading activities, you’ll definitely want to mark your calendar for periodic reviews of all the security settings and information Google provides. It’s a good way to ‘manage by prevention’ and protect your trading business. Photo by tlparadis on pixabay.